Serial number blocks were assigned by the Ordnance Department on an as needed basis, generally in response to the awarding of a contract to a given manufacturer. 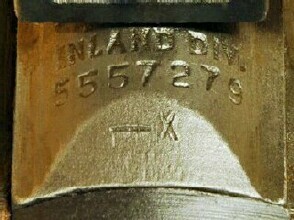 The serial number was placed on the carbine receiver during the manufacturing process of the receiver, not when the carbine was finally assembled. The decision for which receivers would be used for the U.S. Carbine Models M1, M1A1, or M2 were made well after the receiver was completed as all of these models used the same receiver. Given the high volume production, receivers were generally assembled as part of a carbine within a few months after the receiver was serial numbered. However, dating a carbine by it's serial number alone is difficult and not always accurate given the circumstances inherent with manufacturing and the logistics situation during the time the carbines were manufactured. A few of the manufacturers at various times used subcontractors to manufacture their receivers. One manufacturer separated out smaller blocks of serial numbers for use by subcontractors who would use these serial numbers concurrent to receivers being made by the prime contractor and/or other subcontractors assigned lower or higher serial number blocks. Serial numbered receivers that failed to pass inspection were set aside as rejects if the defect(s) could not be brought up to minimum standards. As solutions to old problems were learned, some of the same receivers were brought back online and completed (i.e. Winchester receivers initially rejected because of an off spec deep hole drilled for the recoil spring and guide, later recovered and altered to use a detachable main spring housing). If a receiver was scrapped and not used, it's serial number may or may not have been reused. No documentation has been found that indicates the dates serial numbers were placed on the receivers. No documentation has been found that indicates the serial numbers of carbines when they passed final inspection. Some people estimate a carbine's date of manufacture by adding the quantities manufactured month to month to the assigned serial number blocks. This is not an accurate means of estimating the date the carbine was finally assembled or when it passed it's final inspection. If a receiver has it's original barrel and the barrel includes a date, the date is the date the barrel itself was manufactured. Barrels were usually in short supply and if inventory ran out could shut down production lines. Barrels were usually mounted to receivers within one or two months of the date the barrel was made, however, many carbines have had their original barrels replaced. The start and end dates each prime contractor manufactured carbines in combination with the serial number, a dated barrel, and the parts the carbine has, if all are original to the carbine when it was manufactured may provide a general idea of when it was manufactured. As time goes on more and more carbines are having parts replaced as they wear out, disassembled for the sale of the parts individually are within small groups, and/or carbines are being reconstructed to what people believe they should have been when they left the factory. to also stamp the number on top of the receiver between the rear sight and bolt. to identify one from the other. Not real common, may be collectible depending on a number of things. Carbines having any other letter(s) on the receiver are beyond the scope of the information on this website. Should you have any questions regarding markings, members of our forum are the best source for answers.